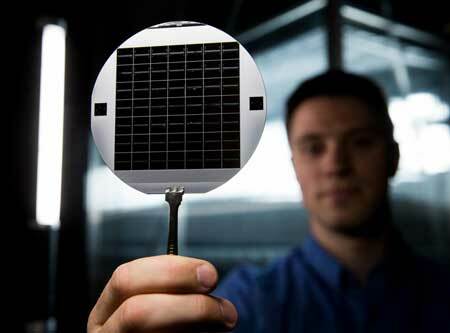 (Nanowerk News) Brigham Young University researchers have developed new glass technology that could add a new level of flexibility to the microscopic world of medical devices. Led by electrical engineering professor Aaron Hawkins, the researchers have found a way to make the normally brittle material of glass bend and flex. The research opens up the ability to create a new family of lab-on-a-chip devices based on flexing glass. "If you keep the movements to the nanoscale, glass can still snap back into shape," Hawkins said. "We've created glass membranes that can move up and down and bend. They are the first building blocks of a whole new plumbing system that could move very small volumes of liquid around." While current lab-on-a-chip membrane devices effectively function on the microscale, Hawkins' research, recently published in Applied Physics Letters ("Electrostatically actuated membranes made from silica thin films"), will allow equally effective work at the nanoscale. Chemists and biologists could use the nanoscale devices to move, trap and analyze very small biological particles like proteins, viruses and DNA. So why work with glass? According to lead study author and BYU Ph.D. student John Stout, glass has some great perks: it's stiff and solid and not a material upon which things react, it's easy to clean, and it isn't toxic. "Glass is clean for sensitive types of samples, like blood samples," Stout said. "Working with this glass device will allow us to look at particles of any size and at any given range. It will also allow us to analyze the particles in the sample without modifying them." The researchers believe their device could also mean performing successful tests using much smaller quantities of a substance. Instead of needing several ounces to run a blood test, the glass membrane device created by Hawkins, Stout and coauthor Taylor Welker would only require a drop or two of blood. Hawkins said the device should also allow for faster analysis of blood samples: "Instead of shipping a vial of blood to a lab and have it run through all those machines and steps, we are creating devices that can give you an answer on the spot." There is an increased demand for portable on-site rapid testing in the healthcare industry. Much of this is being realized through these microfluidic systems and devices, and the BYU device could take that testing to the next level of detail. "This has the promise of being a rapid delivery of disease diagnosis, cholesterol level testing and virus testing," Hawkins said. "In addition, it would help in the process of healthcare knowing the correct treatment method for the patient."